Using the information we learned in the previous article, Understanding Filters, we are now ready to apply that knowledge to choosing the correct filter. Filter size, and we are not talking about the frame size, but the thickness of the filter. 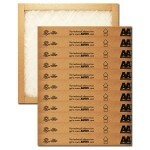 Filters are available from One inch thickness to five inch thickness for normal, everyday filter applications. The part of the filter that ‘catches’ the particles is called the media. The air, which is carrying the particles, flows through the media; the particles are ‘arrested’ against (or caught by) the media. Media types can range from Poly blends to Fiberglass, but for our comparisons this doesn’t really matter. Most available filters use a type of filter media that does not promote microbial growth, does not absorb water and is chemically resistant to a wide range of chemicals. This media is where the thickness of our filter is determined. In the above images you can see the difference in a pleated and a non-pleated filter. The advantage of a pleated filter is that they offer more surface area over a non-pleated filter. All else being equal this means that the pleated filter will allow more airflow. But, as the case so often is, all else is not equal. 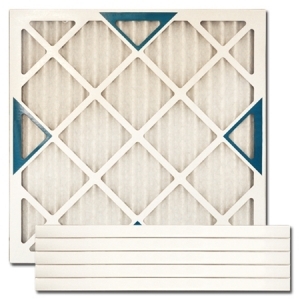 The non-pleated fiberglass filter on the right will allow more airflow than the pleated filter on the right; however, it will also allow more particles to pass through. Most modern equipment is designed for pleated filters and they work extremely well. The fiberglass filter will also work but the frequency that the filter needs to be changed is about double that of the pleated filter. Notice that they are both one inch filters. The pleated filter on the left is a MERV 8 and can be replaced, as a general rule, every 60 -90 days. The non-pleated filter on the right does not have a published MERV and will need to be replaced about every 30 days. 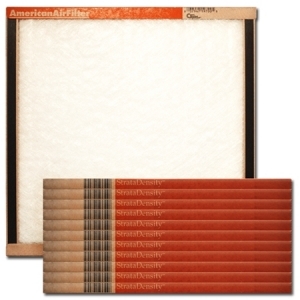 Again, the filters above are a two inch pleated filter and a two inch non-pleated filter. This is where the pleated filter really starts to outshine the one inch filters. The surface area of the pleated filter is about 8.5 square feet where the one inch filter is only 2.7 square feet. The two inch non-pleated filter has thicker media but not more surface area. The pleated filter has MUCH better airflow numbers as the thicker two inch non-pleated filter is much more restrictive. Again, the pleated filter is MERV 8 and the non-pleated filter has no published MERV. Many systems can go 90 days or more using a two inch pleated filter while the non-pleated filter should still be changed about every 30-45 days. You can see now hoe four inch and five inch pleated filters begin to REALLY outshine other filters; even the pleated one inch and two inch filters. Most systems can go six months between filter changes using four inch or five inch filters and some can go as long as a year! Thicker really is better, IF we are talking about pleated filters! Thicker non-pleated filters can cause a very high restriction to airflow which is detrimental to our system and our utility bills! MERV is how efficiently the filter arrests certain sized particles. Generally MERV 8 is very good for home and office general use. In high dust environments or where a known particulate needs to be filtered we would choose another filter which will have a higher MERV number. This would be a case for allergy sufferers or something like a paint booth. Now that we have compared a few filters we will choose a filter for our system in the next article.